You support one another during times of major change like marriage, divorce, and retirement; you comfort one another during times of loss; you help one another find the humor in growing older. Female friendships can be the key to happiness in older women, but they’re not often treated as such. 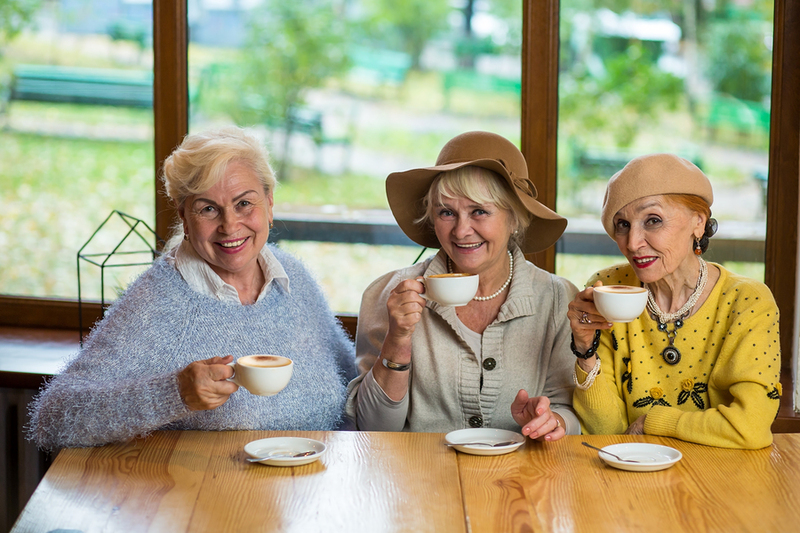 We hear a lot about a healthy diet, regular exercise, and romantic relationships, but female friendships in older age are often treated in society as just good fodder for comedy (see: Golden Girls, The). Friendships aren’t just good for fun and games (although they’re terrific for those, too), they’re also vital to your physical and mental health-and your longevity. Human beings need relationships to survive. Infants can die if they go too long without being held, and the elderly experience an increased risk of mortality without social interactions. Isolation and loneliness are major factors in depression and negatively affect mental, physical, and cognitive health. According to one study published in Industrial Psychiatry Journal titled “Loneliness, depression and sociability in old age (link is external),” “There is a growing body of evidence that suggests that psychological and sociological factors have a significant influence on how well individuals age” (Singh & Misra, 2009). That’s shown clearly in research (link is external)led by William Chopik of Michigan State University who showed in a review of two surveys taken by about 280,000 people that “valuing friendships was related to better functioning, particularly among older adults,” and that “only strain from friendships predicted more chronic illnesses over a six-year period” (Chopik, 2017). Want to eat healthful foods and exercise every day? Grab a friend. It’s a lot easier to eat well and go for long walks around your neighborhood when you’ve got a friend to dine and walk with you. Friends can encourage each other and push each other to be healthier (the positive kind of peer pressure). I write about the connection between friendship and physical health in my book Mindful Aging (link is external), and it’s something I focus on with older adults who seek me out for therapy in Los Angeles. How about mental health? Looking for someone to commiserate with or to validate your life choices? Look no further than your best girlfriend. While your children may not understand the struggles of older age and your spouse (if a man) may not understand the struggles of female older age, your best friend will. Whether it’s menopause or choosing to start a new career rather than move to a retirement community, good friends will be there to complain with you or to support your life choices. But friendships like these don’t happen by accident. You may be used to the idea that romantic relationships “take work,” but did you know friendships do, too? Relationships with friends require nurturing, which begins with having a friendship-focused mindset and intentions and extends to our daily priorities, choices, and interactions. The success or failure of friendships depends on our level of mindfulness. Your genetics and early life experiences significantly influence your friendship skills. But even if you aren’t naturally good at making or keeping friends, you can learn how to connect positively with others. As old friends leave one’s life through time or circumstance, one needs to rebuild one’s social circle. It is never too late to build or repair yours. When you look back on your life, it’s likely you see the years of your most active and abundant friendships as your happiest ones. While it’s probable that the most profound pains you’ve experienced in your life involved breaks within your social connections. It should go without saying that the better you are at making and keeping healthy connections, the happier and healthier you will be. Loving friendships will nourish and enrich your life as you age. They’re worth taking seriously.